I found this on my desktop this morning. Almost deleted it. Decided to post it. Imperfect as heck. Here goes. I usually refrain from saying much when I find people arguing about hatchery and wild salmon and steelhead because the issue is so complex. I believe people should consider the details of each river, fish species, brood stock hatchery program, predator assemblage, in-river fishery, presence or absence of gill net fishery in the river, the possibility of ocean or estuary interceptions (intentional and unintentional), summer flows, winter flows, river and estuary habitat condition, and on and on. Right or wrong, I believe the most useful conversations occur when people are willing to consider all of these factors and figure out what factors are most affecting the wild steelhead. I believe that hatchery programs always represent a risk to wild fish. But I’m not at all able to predict whether the risk will translate into a large of small adverse impact to wild fish, but I am pretty skeptical when someone says that the hatchery fish will “benefit” the wild steelhead. It seems too often that people live in hardened silos where hatchery fish are wicked, benign, or beneficial to wild steelhead. I don’t know any of the details about Washington hatchery programs so I can’t begin to guess what was going on or what the impacts were/are. I do know quite a bit about Oregon steelhead hatchery programs and I know quite a bit about our Oregon coastal rivers. At least I think I do, but it might be fair to challenge my assumption that I know much of anything these days. I’m sure there is as much that I don’t know as what I do know. It is clear that the coastal river hatchery programs provide fish to harvest. It is clear that wild steelhead in a few rivers (not to be mentioned, but we know where these are) are doing quite well (there are enough to catch (even on swung flies) entirely without the presence of a hatchery program. These rivers also produced wild steelhead during periods when hatchery steelhead were stocked and the fishery operated under a 3-daily and 40 per season regulation. Metolius trout certainly made a fantastic increase when the hatchery program was ceased. Clackamas wild steelhead do not seem to have made a big run-increase like the biologists thought they would when hatchery summers were removed above the dam. (My friends tell me this Clackamas statement is off-target for various reasons.) Elk river gets a ton of hatchery fish but the number of wild Chinook has been “stable” (with cycles up and down) for over four decades. It is complicated. I have not seen examples where hatchery fish “helped” wild fish. We focus on land use practices but often ignore the cormorants and seals. The predators are not the only problem but they sure could be a huge problem in some river basins. And then there is the recreational fishery. Hummmm. When some of my friends are hooking and releasing double digits every day – how good can that be for wild fish? We want to have our fun (me too) but if every wild fish is getting handled one or more times, there could indeed be an adverse impact that has nothing to do with competition or interbreeding with hatchery fish. I do get discouraged with some people put me in the “fly guy” category and make all sorts of assumptions about me. Same goes when people lump “gear guys” in one batch and make assumptions about them. I’ve fished gear more years for winter steelhead than I’ve fished flies. What does that make me? I guarantee that the people who want our coastal rivers for development or water rights, or whatever are smiling while we anglers are spitting at each other. I think there are places where hatchery fish make sense by tradition or by the nature of the river. I think there are some places where hatchery programs should be reduced or phased out. I do not support an all or nothing mentality. I do support anglers of different perspectives working together to figure out the most significant limiting factors and seeing what can be done to increase survival of hatchery and wild fish, together in the same river or in separate rivers. Now I’ve gone and done it. Droned on way too long and still not solved the riddle. Point is, no one can solve the riddle without working in a diverse coalition and paying attention to the details. Everyone is an expert these days. OK, I’m done. Not going to say anything more. Movin’ on. This is NOT a high quality video, but I think most tyers will be able to get the gist of how to tie this fly. I shot this on a Go Pro camera that insisted on focusing on my shirt instead of on the fly. The point of this pattern is to imitate the ballyhoo fish shown below in an image I downloaded from the internet at imagearcade. My thanks for this image. As you can see, these are large baitfish and may easily be 5 – 6″ long, so your flies should be similarly proportioned. I fished flies like this in Baja out of Gary Bulla’s in La Ventana last week and had a great time under difficult fishing conditions of wind and short supply of baitfish. Several people in our party caught nice roosters but I did not. I did however catch dorado, skipjack and small jacks. My week was most enjoyable owing to a combination of very nice fishing companions, experienced panga captains, comfortable accommodations, wholesome meals, and Gary Bulla himself, a gentleman/host who is enthusiastic, experienced, and held in the highest regard by his guests, staff, and panga captains. I will follow with posts on the adventure and gear as time permits. My best to you and thanks for all of your good wishes. This is the director’s cut of a shorter video posted on the Oregon Fly Fishing Blog. Thanks to Guy Allen who has tied and fished this fly to perfection and is always prepared to fish some version of the pattern on his yearly trip to Baja. So. Last minute, I decided to join Guy and Jim on their adventure to Baja. I had a great time and some blog posts will follow when I get time to write them. For the week we were there, the sardina caught a few fish but the ballyhoo fly was better because there were not very many flat iron herring around. Still this is a pattern one would be foolish to omit from their Baja fly box. 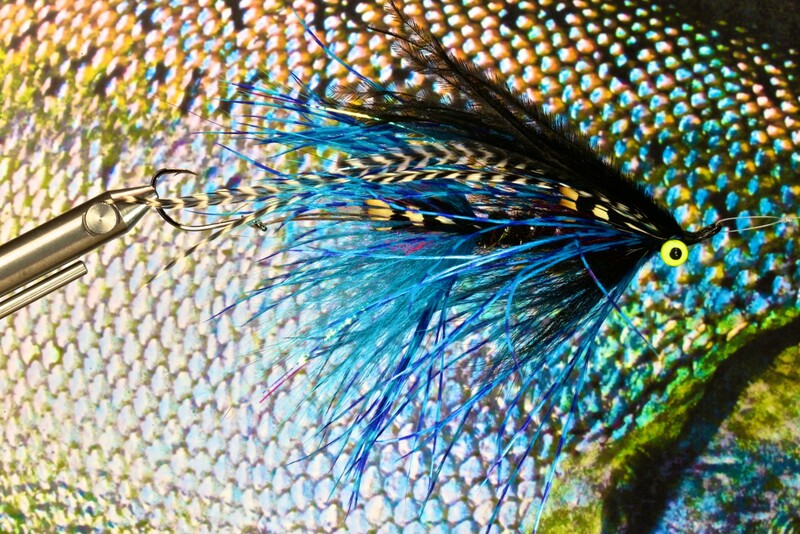 I hope you enjoy the discussion as Guy and I explore the tying and fishing of this great saltwater fly. Chris Daughters asked me to check out the new Faux Bucktail and shoot a video to introduce this material to consumers. I picked out a few colors and it sat on my bench for over a month, with me looking at and wondering if I really wanted to mess with the stuff. It looks so picture perfect. Each fiber is the exact same length and each fiber has a perfect sharp tip. I could tell that the material would not compress and flare like the natural, and that didn’t make me happy. Eventually I gathered courage to test drive the material. My first dozen flies were not entirely satisfactory and I was beginning to doubt the stuff. I should note that I was also trying to tie some odd patterns and not my usual flies, so that probably influenced the outcome of my experiments. Eventually I let go of the exploratory patterns and settled in to tie my signature bucktail fly, the Clouser Minnow. Although the result is a slimmer fly than I am accustomed to tying, the results are quite pleasing. Plus—I am convinced that my new FAUX Clousers will stand up to chewing by black rockfish far better than natural bucktail clousers have in the past. Anyway, I invite you to check out this video, the long version of one that I recorded for the Oregon Fly Fishing Blog. See if you like the fly I’ve created and then decide if you want to try the new material or stick with the usual stinky natural bucktails! Me? I sincerely hope I’m out in a dory sometime in the next few weeks to fish these new found materials. This is a revised post with a slightly different video embedded. My dear friend Jeremy cut the footage together for this short video that captures a few memories of a day this winter season swinging flies for steelhead the the ECHO OHS (one hand spey) rod. As noted in my review of this rod for the Oregon Fly Fishing Blog, I prefer to fish this rod in classic two-hand style and find that it performs flawlessly and makes monster casts feel effortless when fished with an AIRFLO Skagit Scout head. The video has been edited a little from the first one I posted in order to 1) correctly name the ECHO rod as the One Hand Spey, and 2) to show a better view of my super powerful D Loops and give a little justice to how far I was casting — trust me, it was AWESOME. The Most Perfect Glass Bead Bugger . . . This is the long version of the video on tying this fly complete with much conjecture and rambling. The short version will be posted very soon on the Oregon Fly Fishing Blog. I hope you enjoy this extended edit of the video. This is a fly that has caught hatchery and wild rainbow, sea run cutthroat, and summer steelhead on many occasions. Tie and fish it with confidence and vary the color of the glass bead to suit your preferences. Thank you all for your patience and good wishes.